Buy Sameer 1200 mm 70W 350rpm Ceiling Fan Worth Rs 500 For Rs 350 only From Amazon. Well designed fans offer to ensure satisfactory cooling and play a major role in improving the look of a room. Sameer 1200 mm Gati 380 White Ceiling Fan, 70W, 350rpm has been designed with a high level of precision to match the decor tastes of modern day users. Equipped with 3 aerodynamically designed blades, this Sameer fan comes with a 1-year warranty. These ceiling fans comes with a speed of 350 rpm and has an air delivery of 200 cmm. It is equipped with a sweep of 1200mm and has a power input of 70W. The white hue of the fan blends well with the upholstery of the room, thereby creating a warm, inviting ambiance. Created specifically for use indoors it can be used within a home or commercial establishments like office, retail outlets etc. Engineered with perfection, the ceiling fan operates smoothly, without making any noise. The fan's design has been conceptualized as per decoration trends within the room. 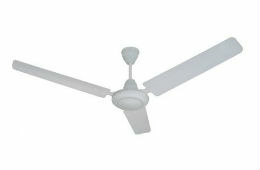 Sameer Gati 380 White Ceiling Fan, comes with a warranty. Ideal for use indoors, it can withstand the needs of time and therefore can be used for years together.